If a fish dish could be described as delicate and intensely flavored all at once, Cod Fillets with Carrot-Ginger Sauce would be the one. You’ll be knocked out by the deliciousness. Simple yet sensational, this fish menu is as satisfying as it gets. You won’t even realize it’s actually low calorie, too. 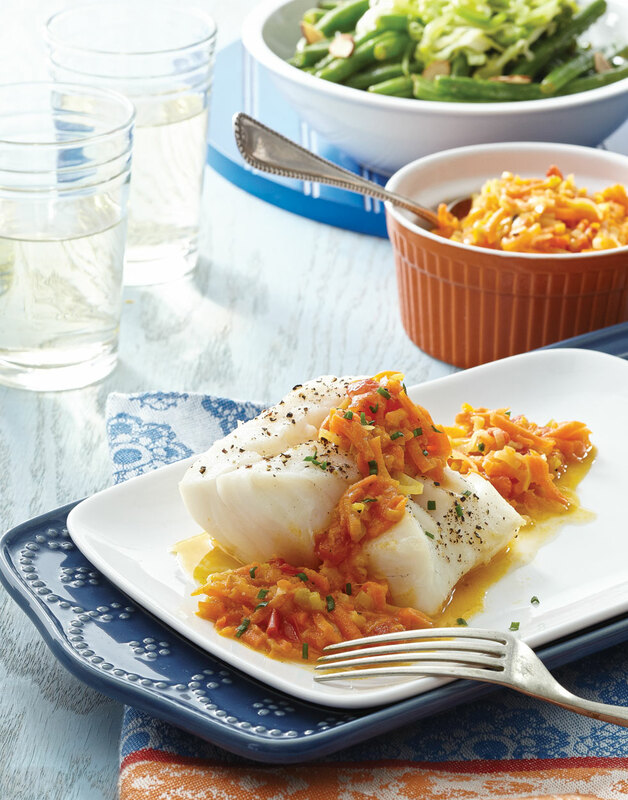 White wine, tomato, ginger, and orange make a savory sauce, a perfect partner for cod’s subtle quality. Sauté carrots, leeks, and ginger in oil in a sauté pan over high heat until carrots begin to soften, about 5 minutes. Add tomatoes and wine, stirring to combine; season with salt and pepper. Place fillets on top of sauce. Reduce heat to medium-low and steam, covered, until fillets are firm, 10–12 minutes. Transfer fillets to a plate and stir zest into sauce. Serve cod fillets with sauce and top servings with chives. So they cook in the same amount of time as the shredded carrots, thinly slice the leeks. Sautéing the carrots, leeks, and ginger over high heat first helps release their flavors quickly. Place cod fillets on top of sauce. The sauce protects the bottom of the fish while it steams. Tender, crunchy, soft, and sweet, these beans with leeks and almonds are the perfect combination of texture and flavor.